The documents, information, graphics, forms and structure contained within this site are copyright © 2016 InnoMedia, Inc. All rights are reserved. 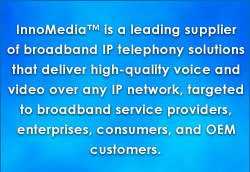 InnoMedia, InnoSphere, Smart-DQoS, Smart-MGPI, are trademarks of InnoMedia, Inc. All rights are reserved. In the preparation of these web pages, every effort has been made to offer the most current, correct and clearly expressed information possible. All information contained in this Site is provided “as is”, with no guarantee of completeness, accuracy, timeliness or of the results obtained from the use of this information, and without warranty of any kind, express or implied, including, but not limited to warranties of performance, merchantability and fitness for a particular purpose. Nonetheless, inadvertent errors can occur, and applicable laws, rules, and regulations often. In no event will InnoMedia, its related partnerships or corporations, or the partners, agents or employees thereof be liable to you or anyone else for any decision made or action taken in reliance on the information in this Site or for any consequential, special or similar damages, even if InnoMedia has been advised of the possibility of such damages. Copyright © 1998-2016 InnoMedia, Inc. All rights reserved. All content and graphics on this Site is protected by U.S. and international treaties and may not be copied, reproduced, reprinted, redistributed, republished, or resold in any form without prior express written permission from InnoMedia, Inc. This includes all text, illustrations, graphics, logos, icons, photos, as well as the “look and feel” and underlying software of the Web Site. The materials from InnoMedia’s website are available for informational and noncommercial uses only, provided the content and graphics are not modified in any way, and all copies of any materials include InnoMedia’s copyright notice. No other use of the information provided is authorized. If you have any questions about these terms, or would like further information about materials from InnoMedia, please contact us at +1 (408) 432-5400 or send email to info@innomedia.com. InnoMedia Inc. (“InnoMedia”) is committed to protecting your privacy on-line. We hope the following information will help you understand how we collect, use and safeguard the personal information you provide when visiting our website. InnoMedia collects data on website visitors who submit queries for product or company information or technical assistance. This information can only be collected by InnoMedia from users who voluntarily submit their information by entering it into a form and submitting it to the InnoMedia web server. Our server has a log file that tracks user sessions, i.e page views and downloaded files (for example, product data sheets and white papers). We maintain these log files solely for our own internal purposes. Log files are not shared with third parties. InnoMedia does not share personal identification information with third parties. This information is maintained solely for our own internal purposes. We use an email link from the Contact Us page to allow users to contact us directly with questions or comments. We read every message and we try to respond promptly where appropriate. Our Customer Service department routes messages to the department that may best respond to user questions or comments. We may file comments to improve the website and online store. The comments are for internal use only and are not shared with third parties. In some cases, we send a confirmation email to verify that we have received the user’s request for information. Email addresses provided to us to request product or company information will be used to supply the requested information. We may also use user’s emails to communicate with them about any special offers or promotions InnoMedia may have. When website visitors request us to mail them information, or to ship product, we collect addresses and phone numbers. We require a phone number to contact users in the event of a question or problem with an order or request and this information is not shared with any third parties. Any addresses we collect are used for mailing requested information to users, or to ship product that has been ordered. Addresses are not shared with any third parties. Occasionally we may use mailing addresses to send users information about special offers or promotions InnoMedia may have. Any information we collect is stored in a database that is in our secured network. Any updates or changes to this policy will be posted here immediately. We encourage our visitors to review this policy periodically for any changes or updates that may have been implemented. InnoMedia may disclose your personally identifiable information in the following circumstances: (1) InnoMedia is required to do so by law or in the good-faith belief that such disclosure is necessary to (i) conform to the edicts of the law; (ii) comply with legal process served upon InnoMedia; (iii) protect and defend the rights of InnoMedia, the InnoSphere website, or other subscribers to the service or (iv) act under exigent circumstances to protect the personal safety of InnoMedia, the InnoSphere website, subscribers or the general public; or (2) all or substantially all of the assets of InnoMedia are sold to a third party.